Are the Orlando Magic a Playoff Team After Free Agency? The Orlando Magic playoff drought currently sits at six seasons. Even though they were playing in a watered-down Eastern Conference the entire time, they have not been able to get over the threshold of being one of the East's eight best teams. With a new coach, renewed faith and LeBron James heading out West, can the Magic close that gulf? 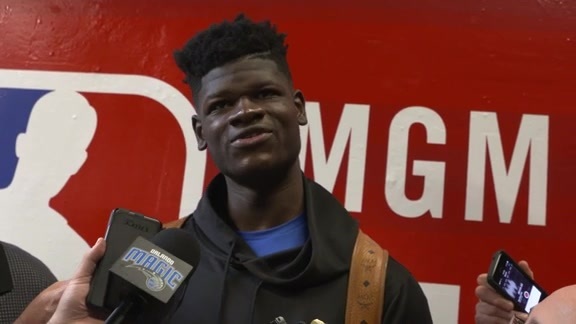 One of Orlando's top reasons for hope, first-round pick Mo Bamba, certainly thinks so. "I can definitely see us being a playoff team," said Bamba after the Magic's recent Summer League game against the Memphis Grizzlies. Youthful optimism is certainly running high in Las Vegas and many fans are starting to believe the hype as well. They have seen Bamba play three games with last year's top pick, Jonathan Issac and gotten a glimpse of what the duo could combine to be. These are positive steps for an organization that not had any recent reasons to celebrate. It is important to remember, however, that there have been a couple times over the course of this rebuild that we have jumped to conclusions about a possible playoff berth. The first time was in 2015, when the Scott Skiles-led Magic battled to a 19-13 record heading into the new year before the wheels came off. Soon, Skiles and team leaders Tobias Harris and Victor Oladipo were out the door. Positive vibes were ignited again this past season when Orlando got out to an 8-4 start, only to see injuries derail the team and Frank Vogel lose his job at season's end. This feels like the third time in recent memory that the word "playoffs" is being thrown around, but I just do not see it in the cards for this team yet. There may still be some moves before all of the rosters in the East are set, but with free agency settling down, we have a fairly accurate picture to look at. With the exception of a possible trade of veteran big man Nikola Vucevic, the Magic's plan certainly seems set. The buzz built and then dissipated around the team's potential acquisition of electric scorer Isaiah Thomas and they seem set to enter the season at point guard with D.J. Augustin and newly acquired Jerian Grant. Similarly, in the aftermath of LeBron's Lakers decision, the rest of the league's teams are starting to take form. There are four teams that I consider postseason locks in the East: Boston, Philadelphia, Toronto and Washington. Certainly, the first two are the class of the conference and the latter two are in their own separate category, but I think we can all agree that these squads are shoe-ins. I also see three playoff teams from last year, Miami, Milwaukee, and Indiana, as superior teams to the Magic. The Heat get a healthy Dion Waiters back to complement their deep roster, the Bucks have the East's best player in Giannis Antetokounmpo and the Pacers duo of Oladipo and Myles Turner has another year under their belts. Thave leaves one final spot, one Orlando can certainly compete for, but I do not think they will ultimately get it. Assuming health around Blake Griffin is a bit of a gamble, but if his pairing with Andre Drummond gets off the ground, I have to believe that is good enough to get Detroit into the playoffs. The good news is that the Magic have clearly separated themselves from teams in East basement like Atlanta, Brooklyn and Chicago. The bad news is that with the mega headline of LeBron's departure, the conference's overall demise may be a bit exaggerated. Stay connected to all the Orlando sports news and events by subscribing to 407area.